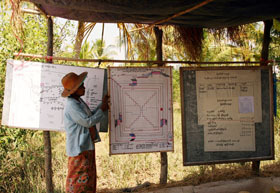 The DRP-CURB programme employs a holistic approach towards developing the resilience of urban and coastal communities in Myanmar to natural disaster, by employing a range of targeted interventions including capacity development, vocational training programmes, policy support, and facilitating ongoing dialogue between key stakeholders and affected communities. DRP-CURB is supporting the Government of Myanmar to develop cities that drive sustainable and inclusive economic growth and provide resilient and safe environments for their people in three major policy documents: the Myanmar National Building Code, the National Housing Policy, and the National Urban Development Policy. Disaster Risk Reduction (DRR) and Climate Change agenda are relatively new in Myanmar. Myanmar is also a signatory of ASEAN Agreement on Disaster Management and Emergency Response (AADMER) which has entered into force on 24 December 2009. Following Cyclone Nargis, there was an increased awareness of the need for DRR interventions and the tenets of DRR began to be embraced by the government, although primarily focused on specific themes (CBDRM) and geographic area (Ayeyarwaddy and Rakhine). However over past few years, it has become high on Government agenda thanks to the ongoing advocacy and support of donors. One of the most significant in this regard has been the Ministry of Foreign Affairs, Norway which has continued to fund DRR under UN-Habitat’s DRP-CURB programme. This has helped UN-Habitat to be one of the leading key agencies supporting Myanmar with multi-governance approach in DRR actions promoting policy initiatives at the national level, and capacity building at regional, city and community level. Supported by UN-Habitat, the Government of Myanmar (GoM) launched number of initiatives such as Myanmar Action Plan for Disaster Risk Reduction (MAPDRR) 2009-2015 and invited development partners to support the national actions of DRR. In November 2009, a milestone was reached between the Ministry of Foreign Affairs of the Government of Norway and UN-Habitat, an agreement for the implementation of a comprehensive multi-hazard DRR programme: Disaster Response and Preparedness – Coastal Communities and Urban Risk (DRP-CURB) was established which prioritized cost effective service deliveries to: (a) the most vulnerable communities in terms of either Disaster Risk and/or Climate Change; (b) ensuring institutional policies and capacities were in place for a supportive environment for service delivery; and (c) build and instill capacities of local stakeholders including the public, for preparedness, mitigation and adaptation measures. This agreement has been successfully implemented over the past four years forming the backbone of UN-Habitat’s DRR strategy (‘Myanmar Comprehensive Disaster Risk Reduction Programme (MCDRRP)’) and UN-Habitat’s Urban Support Strategy (‘Myanmar Safer Settlements and Urban Research Programme (MSSURP)’). 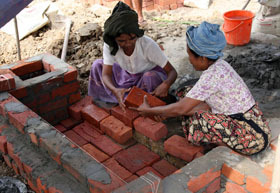 Over the years, the DRP-CURB Programme has allowed UN-Habitat to strengthen and broaden its reach within the DRR sector and the cross-cutting sectors of Urban Development and Housing, Land-use planning, Climate Change and the Environment by providing the foundation to scale up and add-on complementary activities.